Two scuba divers who survived devastating brain injuries are to lead a 24-hour underwater scubathon to raise funds for a charity which helps people who have suffered a brain injury. Members of Cheltenham Sub-Aqua Club, regular visitors to the National Diving & Activity Centre, will work as a relay team to spend a full day underwater led by divers James Neal and Neal Breeden. Over the weekend 16th & 17th September we will also be holding a demonstration day and raffle with prizes from Apeks, Suunto, Fourth Element, Maxshow, Sea & Sea and Fathom Outdoors. We also have 3 dive computers donated to the NDAC Shop by Suunto where all the money from the sale will go towards the fundraising. There are more prizes to follow and tickets are available from the NDAC shop. On the demo days we have Liquid Sports, Mares, SSI , Sea & Sea, TDI, Fourth Element and Maxshow. James, 47, a technical diver and instructor from Symonds Yat, in the Wye Valley, suffered a devastating subarachnoid haemorrhage following the rupture of an undiagnosed aneurysm, which led to a grade four bleed on the brain. Neal, 48, Cheltenham SAC’s secretary also survived a brain injury, after suffering a major stroke nearly ten years ago, in 2008, which left him needing to use a wheelchair. Now the pair are organising the scubathon in aid of UK brain injury charity Headway, which supported James during his initial recovery. They hope to raise in excess of £5000. 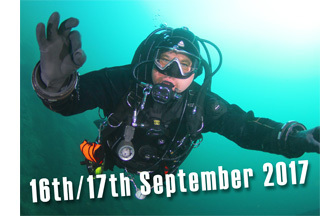 The dive will begin on Saturday 16th September and finish at midday on Sunday 17th September, at the National Diving and Activity Centre in Chepstow. James says, as well as supporting Headway, he wants to raise awareness of brain injuries and highlight some of the prejudices that go hand in hand with what is described as an ‘invisible disability’. After he was treated, James, who ran his own business, says all he wanted to do was get back in the water and enjoy scuba diving again. That desire drove his initial rehabilitation. He said: “I was able to return to some level of fitness and get back in the water but I had a great deal of support from my scuba diving friends. Without Cheltenham Sub Aqua Club my life would have become very lonely. I owe them an enormous debt of gratitude. “I suffered a subarachnoid haemorrhage and whilst I might appear completely recovered on the outside, you can’t and don’t see what I have to deal with, or understand the problems I face, on a daily basis. “I’m learning to manage my condition but it’s still difficult and I have suffered some horrendous discrimination as a result of people not understanding my disability. But Cheltenham Sub Aqua Club has remained a constant in my post injury life. I don’t know what I would have done without them. “I suffer terribly from fatigue. Immediately after the injury I was able to stay conscious for perhaps 20 minutes at a time. Now as the day goes on I get more and more fatigued. And there is a huge difference between tiredness and fatigue. “If you suffer a head or brain injury it can take a long, long time to recover and in fact you might never recover, at least not fully. Neal, who worked as an upholsterer before suffering his major stroke when he was just 39, says Headway is an amazing organisation that few people will have heard of. He added: “Hopefully we will raise a good deal of money for Headway; the whole club is behind the event. And divers from across the country are supporting us. Ali Hendley, Manager at Headway Gloucestershire, said the money raised by the underwater scubathon would be very valuable and said: “Giving brain injury survivors the chance to re-learn old skills and develop new ones is what Headway is all about.